"The goal is not a smack-down, but a coming together. We need to heal the gap," said Tom Keer, president of the Keer Group, who led the discussion. The gap between, for example, "bass boat Bubbas" and "snobby fly fishermen" would appear to be Grand Canyon-sized. "We use Latin words and quote from 500-year-old books," said Ross Purnell, editor of Fly Fisherman magazine. "We do some weird stuff." But that divide may be one of mostly perception rather than reality. The emphasis Thursday was on the importance of an united angling front. 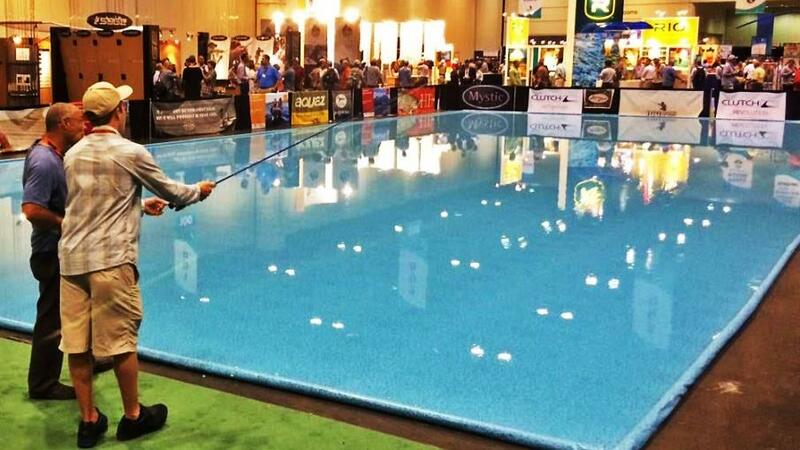 Noting this second-year merger of ICAST with the International Fly Tackle Dealer Show, Keer said, "It's the right way to go. We need to do this in lockstep." Do what exactly? Most importantly, grow the number of U.S. anglers, which has been around 42 to 46 million for about four decades now. Secondly, be vigilant in maintaining and increasing angler access to fishable waters. Keer noted two disturbing trends in the crucial age 6 to 15 population: 1) in 2011, a survey indicated 11 million U.S. anglers in that age group, and 48 million video gamers; 2) in 1970, only 8 percent of that age group was "overweight," and it's now 39 percent. Those numbers represent a rapid growth of youth who prefer being indoors and sedentary versus getting outdoors and being active. "We are losing a generation of anglers," Keer said. "We need to pull together and do something about this." There were no grand plans offered on how to accomplish that goal. This panel was focused on the typical users of fly fishing and conventional tackle — the overlap that already exists and the opportunities to grow that segment. Keer noted that companies like Simms, St. Croix and Loomis already market their products across both angler communities. Rich Hohne, digital marketing director and public relations manager for Simms, said that sponsorships with Bassmaster Elite Series anglers Aaron Martens and Brandon Palaniuk had helped produce an increase in bass anglers looking for Simms products, which until recently had been associated primarily with fly fishing. "We are getting consumers to go into fly shops," Hohne said. "They're asking us, 'Where do we get that?" Hohne noted that the pro bass anglers, "Put gear to the test like nobody else." Increasingly, the big outdoor chains like Cabelas and Bass Pro Shops include a well-stocked fly fishing section. That has helped merge the markets, noted Hohne, who said, "The bigger stores are doing a better job (of servicing fly angler needs)." Peter Jenkins is president and CEO of The Saltwater Edge, which has its flagship store in Middletown, R.I. They emphasize cross-marketing at every opportunity, even in their weekly fishing reports. "We always list both the best lure and the best fly for the current conditions," Jenkins said. For the saltwater fishing market in particular, Jenkins noted, weather conditions produce anglers that are comfortable using both conventional and fly fishing gear. Stiff winds on a particular day will put conventional tackle into the hands of even the most ardent fly fisher simply out of necessity. Ken Cook, managing editor of Fishing Tackle Retailer, mentioned that the magazine will feature fly fishing more in the future. It's another example of an increasing readership that wants information on both conventional and fly products. On another note, both Cook and Purnell revealed their readership surveys were encouraging for the future of print media. In an era when newspapers are losing readership in big chunks to digital media, fishing enthusiasts still enjoy holding a magazine in their hands. "There is still a big role for print," said Purnell of Fly Fisherman. "Our readers like to look at the magazine, and I don't think that's going to change. About eight years ago there was a repositioning of media, but I think everybody has found their place." Purnell had an interesting take on what gives fly fishers the reputation of being "elitists." "I think it's the $800 rods," he said. "That's the thing I hear the most. But it's not true. You can get a decent package — rod, reel and line — for $100 to $200. The price to entry is within anyone's budget. I think it's a myth that fly fishing is too expensive." So, no, there was no "smack-down" during this panel discussion; it was more of a love-fest. There is evidence that conventional tackle users and fly anglers have more in common than ever before. And those shared interests are a key to the future of sportfishing. "Fly fishermen and conventional anglers are unified in what they want to do — catch fish," Cook said. "I think we'll get closer and closer together. I think we're in it for the same reason."